Buy any 2 kits, Get 1 FREE! In-office 37.5% hydrogen peroxide in a neutral pH formula. Contains potassium nitrate to inhibit post-operative sensitivity and maximize patient comfort. Light activation of the gel is optional. Three 8-minute treatments are typically all that is required. Dual-barrel automix syringe mixes as you apply the gel to the teeth. Contains: 1 x 2.8ml syringe Pola Office+ gel, 1 x 1g syringe gingival barrier, accessories. 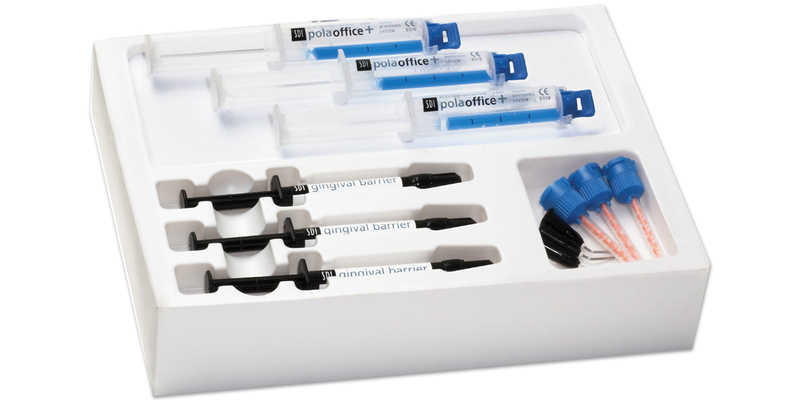 Contains: 3 x 2.8ml syringes Pola Office+ gel, 3 x 1g syringes gingival barrier, accessories.